Wow...Look what we just found stuffed away in the back of our warehouse! The super slim rare & discontinued Mugen has everything that makes great unique watches, simple & stylish with an original way of telling the time! The circular display is deceptively easy to read: Around the outer edges are 60 LCD segments, each indicating one minute. They are shown in groups of 10 minutes and are easy to read at a glance. Each block in the inner spiral of blocks represents one hour. This is one of those designs that at first it seems impossible to read, but like most watches available from Tokyoflash, once you understand how it works it's fairly simple and within a few days you can tell the time just as fast as a traditional wall clock. The LCD display is mirrored with blue tinted segments and the display is "always on" so there is no need to push a button to see the time. 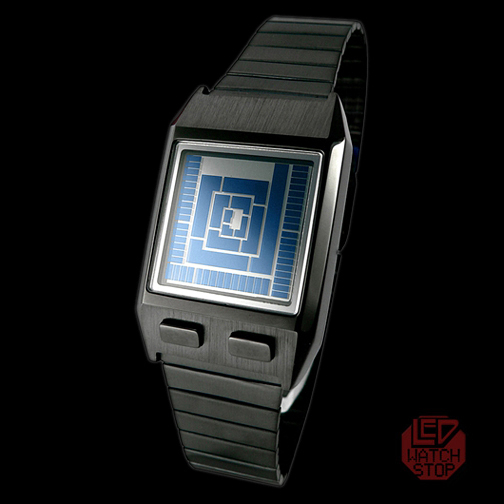 This watch also has an animation feature. Once a minute, the display spirals all the way off and all the way on, then settles back onto the current time. One of the most notable features of Mugen is its size and weight. The slimline strap is just 1.5 mm thick and the whole watch weighs just 60 grams. Ideal for smaller wrists this is a design that would look great on either a guy or a girl and is finished with a neat, comfortable clasp.